Do you like surprises? Sure, it’s fun to get a gift from Santa that you weren’t expecting. But most people don’t like to be surprised, even if it is for a good reason. That certainly holds true to having overnight guests. Yes, if you kid surprises you by coming home from college early, it’s not a problem. But if a friend you haven’t seen in ten years pops up in town and needs a place to stay, then that might be a challenge. You need time to get the house ready. That’s why you should know if you’re having overnight holiday visitors well in advance of their arrival. That will give you plenty of time to get everything ready. It doesn’t have to be perfect, just welcoming. 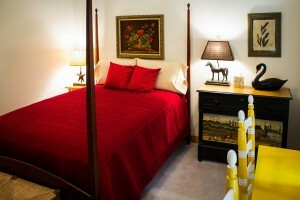 Have you ever spent the night in your guestroom? You might actually discover a lot of interesting things starting with the mattress. If it hasn’t been slept on by a lot of visitors, then it could actually be in better shape than your bed. That might not hold true of the pillows. Usually the guestroom pillows are the “cast offs” from the rest of the house. Same for sheets and blankets. Those can work unless they are really threadbare. Then it is time to replace them. At the very least, all the sheets, blankets, pillowcases and comforters should be run through the wash.
You’ll also want to make room for their clothes. Even if they’re just staying for the weekend, they probably don’t want to live out of their suitcase. You might need to clear some space in your closet or surrender a dresser drawer. Instead of looking at this as a chore, consider it an opportunity. It’s a good chance to get rid of some unwanted items. That’s where Junk King Chattanooga comes into play. Once you’ve gathered up all the things in the guestroom that need to be hauled way, set up your session with Junk King. They’ll send over a pair of movers and a big truck to take care of that task. You’ll be amazed at how quickly they can clear out a room, garage or closet of clutter. Let Junk King Chattanooga help you get your guestroom ready for holiday visitors. It will be one less thing to worry about. This entry was posted in Chattanooga Junk Removal and tagged holiday visitors, Junk King, junk removal on November 30, 2017 by Junk King. Last updated December 1, 2017 .